Forgiveness is the way of the Lord and His son: it is the way to a peaceful, happy, and fulfilled life. The act of forgiving, however, often requires immense strength of spirit and can prove almost impossible at times. Nan Self has written this book to give support and guidance to those of us who are struggling with granting the grace of forgiveness to others who have hurt us. Forgiveness is not only a gift to others but it is a gift to ourselves, and with it comes freedom and contentment. Nan compassionately illustrates how to live a life of grace and forgiveness and helps readers return to their walk with God. 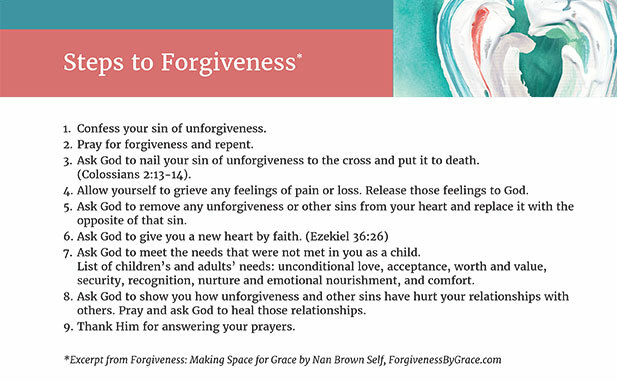 From the moment I picked up Nan Brown Self’s book, Forgiveness: Making Space for Grace, something wonderful began to occur. I became keenly aware of the power of forgiveness and how much God wants us to be free of the guilt and shame of the past. If you need to forgive someone, including yourself, this book offers real hope, help, and healing! Nan Brown Self is a remarkable person with gifted compassion and love, deep wisdom and common sense, and amazing forgiveness and grace. She has written a profound book that will bless many people with wondrous forgiveness and generous grace. This book will help both individuals and study groups. 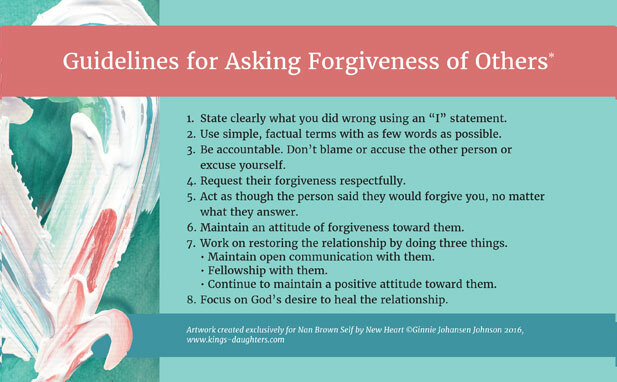 Her helpful insights, suggestions, reflective questions, worksheets, and prayers will stir and advance your experience and understanding of forgiveness and grace in your life. All of the Fruits of Forgiveness Benefit You. Each fruit of forgiveness is a gift from God that you receive when you forgive. It creates a release in your spirit that brings freedom, peace, unity, and healing.